Startled at the sight of a crack in your basement flooring? Start here with this guide to determine whether or not you have anything to worry over. Q: We moved into a new house and I just noticed some cracks in the basement floor. They don’t look new, but I can’t be sure. Should I be concerned? Do I need to call a professional to take a look, or can I fix the cracks myself? A: Odds are, the cracks in your basement floor are not indicative of a bigger problem. Keep in mind that basement floors do not bear the weight of the house as basement walls do, so cracks in a basement floor won’t affect your home’s structural integrity. Still, occasionally, a floor crack can be the first sign of a larger issue. Use the following visual cues and clues to understand what cracks you’ve noticed could mean and whether or not you need to have them repaired. Hairline cracks need no repair and are not indicative of a larger problem. Be they straight, jagged, or spiderweb-like, fine cracks in the basement floor commonly result from surface shrinkage as the concrete dries. They typically show up two to 12 months after the basement floor is poured, depending on how quickly the slab dries and how much humidity remains in the basement. Fear not: They are superficial and require no repair. But it’s a good idea to seal ⅛-inch or wider cracks. Like their hairline cousins, slightly wider cracks in a basement floor are merely the result of shrinkage and do not indicate a larger problem. Anything wider than ⅛-inch, however, should be sealed to keep moisture, soil smells, or even soil-borne gases (see section on radon gas below) from seeping through the basement floor. You can seal them yourself with an elastomeric caulking sealant made for use on interior masonry (available from home improvement stores for $25 to $45). Application methods vary by brand, so read product instructions carefully. 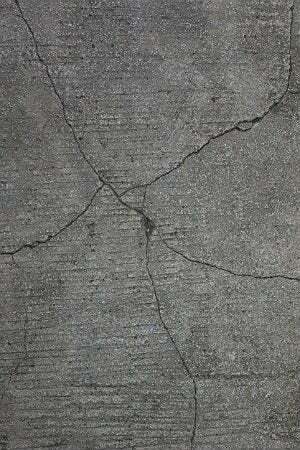 Seal perimeter cracks, which are caused when the concrete floor shrinks away from the foundation walls. 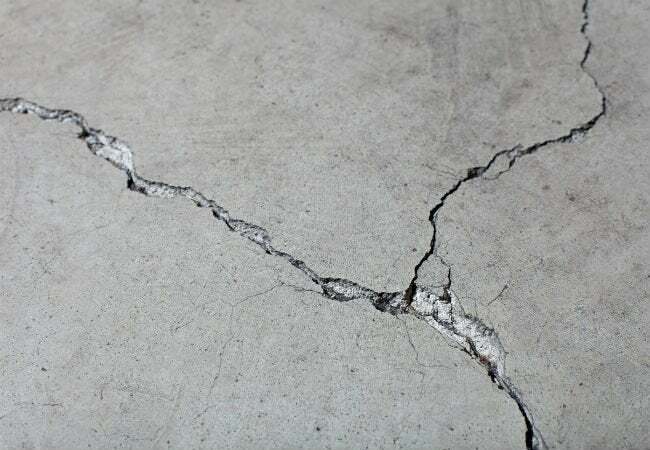 Failure to tie the concrete floor into the foundation wall with steel reinforcement during the initial pour can exacerbate this cracking issue, resulting in ½”-wide (or wider) cracks where the basement floor meets the wall. These cracks in the basement floor, like those appearing elsewhere, are not indicative of a structural problem but should be sealed in a similar manner using an elastomeric caulking product designed for use on interior masonry. Unfortunately, since more spalling is likely to occur in the future, you can’t simply hide the problem with paint; when the next layer flakes away, it will take the painted coat off with it. If the sight bothers you, though, consider coating the problem area with a concrete resurfacer. Or, install a basement-appropriate flooring—such as tile, indoor-outdoor carpeting, linoleum, or a floating laminate—over the concrete subfloor. Cracks caused by settling can be filled and leveled. Settling occurs when the foundation contractor either didn’t sufficiently compact the soil before pouring or didn’t use an adequate base, such as sand. As a result, the concrete slab cracks under its own weight and the half that is less supported sinks into the depression beneath. If the settled part of the slab sinks ½-inch or more, the resulting uneven surface can create a tripping hazard. Fortunately, the lower area can be filled with a self-leveling cement product (available from DIY centers for about $25 to $55) to mitigate incidents and injuries. Know that, if the floor is not done settling, you might have to repeat the leveling process in a few months. Settling of new construction should stop within 12 to 24 months; if you can wait it out, it might be best to apply the leveling product after that time. When a section of the basement floor cracks and heaves slab upward, then you have a problem. This sort of damage suggests soil expansion beneath the basement floor: Soil that contains clay will expand when it becomes wet, creating enough upward pressure to crack and lift a slab floor. While other basement cracks can often be tolerated, even ignored, cracks caused by heaving should be addressed and repaired, with measures taken to prevent recurrence. Resolving cracks and unlevel floors caused by soil expansion is a job best left to the pros, who may advise and carry out solutions as extensive as replacing the basement floor and/or install an interior drain beneath the floor to collect future groundwater. These projects could run into the tens of thousands of dollars, depending on the size of the basement. 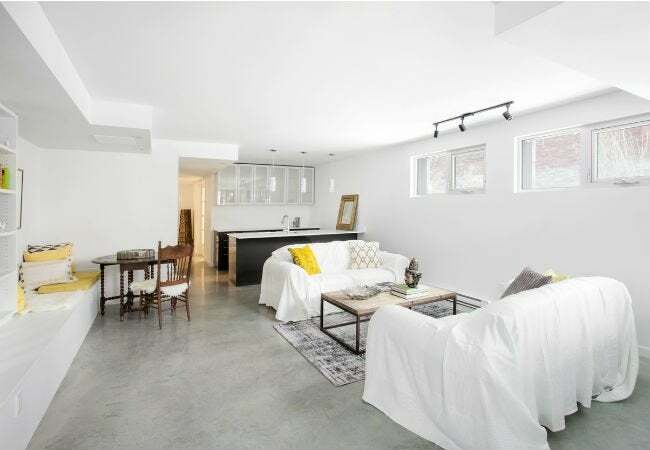 Of course, not all heaving will require a total replacement of the basement floor, but that’s a call that should be made by a reputable foundation contractor. • Check that drain tile is installed around the exterior of the foundation to collect groundwater and direct it to a sump bucket, where it’s pumped away. If your home does not have drain tile or if the drain tile has collapsed, groundwater could be getting under the floor and causing the soil to expand. • Grade your yard with a minimum 2 percent slope away from the foundation and installing guttering and downspouts. Most basement cracks do not present a radon gas risk, but you should beware the possibility. If you live in an area where radon gas is a problem, there is a chance that the gas could seep through cracks in your basement floor and into your home. You can find out whether you live near a radon zone on this US Environmental Protection Agency site. The EPA suggests keeping a radon detector, which runs $15 to $30, in your home to be on the safe side. Like smoke detectors, radon detectors emit a loud beep when they detect dangerous levels of radon—a colorless, odorless, and tasteless gas—in the air. If a radon detector identifies a dangerous level of radon, the EPA recommends having your house professionally tested for radon. Homes that test positive should be treated by a licensed radon-mitigation contractor, who will seal all cracks and then take additional steps to eradicate the gas problem by installing a radon-reduction system that uses pressurized air, fans, or other methods of ventilating the gas away from the basement. Radon remediation typically costs $1,000 to $3,500 and may also increase your utility bills since electricity is required to run the ventilation system.